No sewing got done this weekend, it was all about gardening, sunshine, and ibuprofen for me. We have had such a nasty, miserable spring this year that I simply could not stay inside the house. The sun was out, the garden was calling me, and by Saturday night so was the bottle of painkillers. But the snap peas are in the ground, and lots of weeds are gone from sight. I know, I know – the christening is coming up fast and the dress isn’t done. Luckily I work well under pressure. 😉 Tomorrow the real Maris will be back – sewing like crazy. 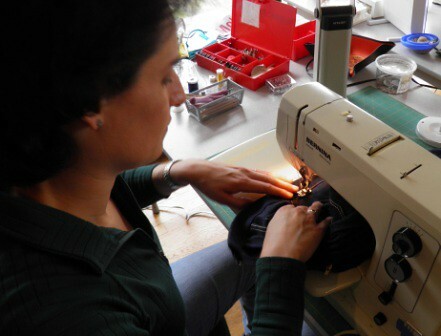 Jenny started sewing lessons with me about 6-7 months ago, ostensibly to learn to make home dec items. You know, like pillows. I *might* have mentioned somewhere along the line that home dec was not my favorite kind of sewing, but she ignored me and forged ahead. After a few pillows, she started talking about how fun it would be to make cute clothes for her two daughters (who BTW, are two total lamb chops). Twirly skirts were first, and now she is on to jumpers and more. Then I started on my jeans-making obsession. So Jenny got on that bandwagon too. 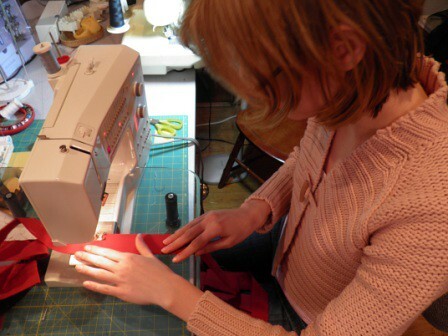 She borrowed one of my, er, several sewing machines so she could practice sewing at home. Then Sew Expo came along, and she decided to at least go talk to all the sewing machine vendors. Yep, now she owns a new Viking machine with plenty of bells and whistles. Oh, and there’s her eBay serger purchase, too. Did I mention that? Today Jenny was finishing up her first pair of jeans. Nice work! 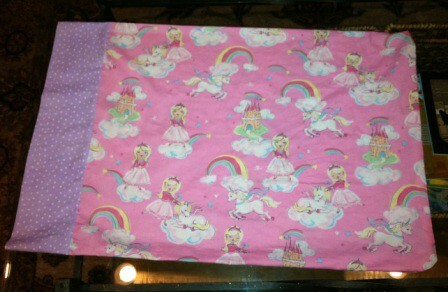 Here is a darling pillowcase she made for one daughter, and yes she did make a second one for daughter number two. 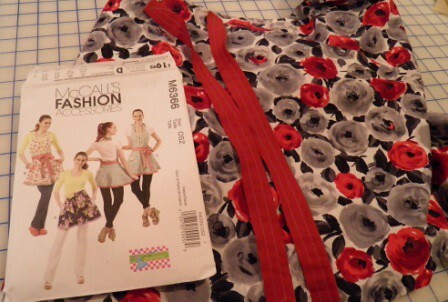 Once you get started, you just don’t have any idea where the sewing bug will take you. I hope Jenny’s husband is happy Jenny and I met. I know I am! Keep on sewing, Jenny! 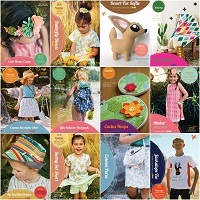 If you have been pining for a few patterns from the McCall pattern company (Vogue, McCall, Butterick), they are having a SUPER SALE online. 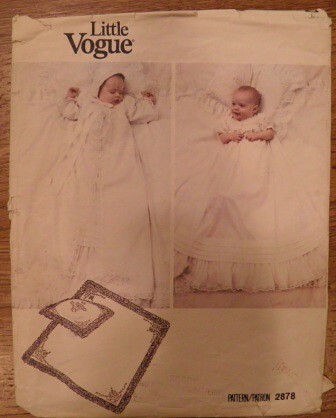 Only $1.88 for Butterick and McCall, and $3.88 for Vogue (plus shipping). It usually takes about a week for my order to arrive, so you won’t be able to sew with them today, but maybe by the weekend? Joann’s had a Vogue pattern sale last week for 3.99, so I already grabbed a couple I thought were interesting in the new spring collection. I might work on fitting these AK pants when I am at my spring ASG retreat the end of this month. And I LOVE the blouse for spring. That is, if we ever have a spring here in the frigid PNW. I should never buy another pattern, but somehow I can’t stop myself. What are you in the mood for making for spring? Let me know what you are planning (or at least dreaming of making) for your wardrobe! One of my darling students, Elena, is a beginning sewist with a definite sense of style and a precise approach to sewing. She is such a fast learner, AND a fast stitcher! 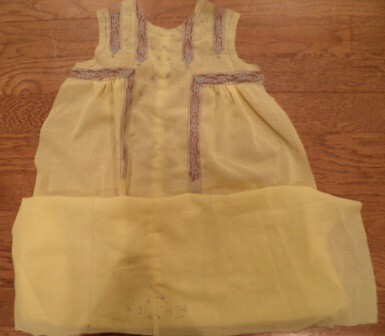 I love it when students sew fast—it shows me they are definitely the boss of the sewing machine. Elena is busy these days working on a pretty new apron. I love the main fabric she selected for this garment—all my favorite garment colors. 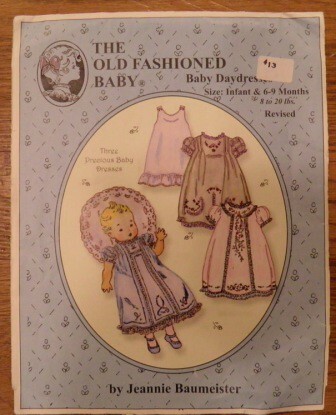 I think this pattern is adorable too, and it makes me think maybe I should add a fresh apron or two to my tired old collection. Wait—I really only have 1 apron. Guess that isn’t much of a “collection”. Anyway, back to Elena’s project. 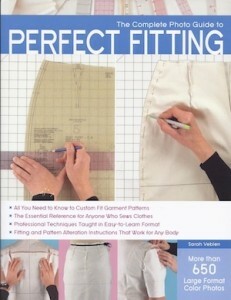 Like most patterns, this one includes some techniques that are transferable to other garments as well. Like the ruffled edge around the hem. 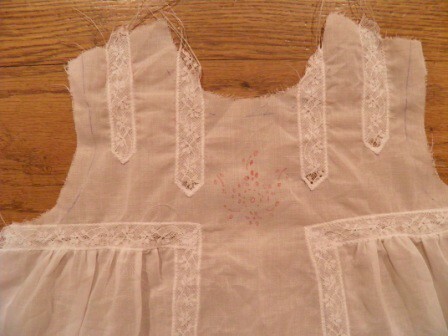 And turning the bodice edges under twice and topstitching. 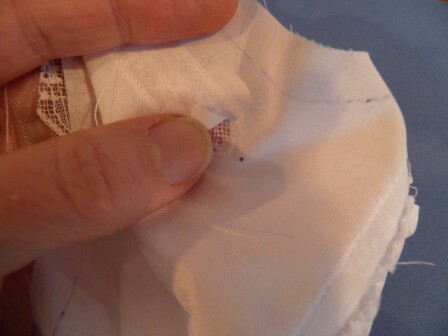 Lots of applications of this hemming technique on other garments and in other places. 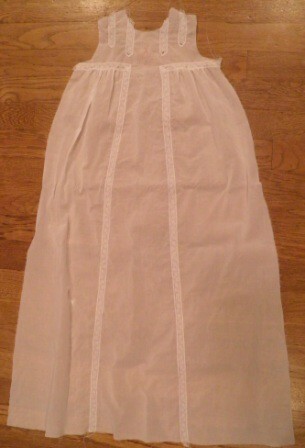 Elena also chose to use French seams on the apron skirt to enclose the raw edges. Nice touch! Elena is a star student in my book, because she only likes to work on techniques she doesn’t understand during our lesson time. Otherwise she sews independently at home. Awesome! Here she is working on gathering the ruffling to be applied to the bottom of the apron. Aren’t you just itching to see the final product? Jeans! They are just pants with lots of top-stitching, right? I must be a glutton for top-stitching – I love making my DH’s dress shirts and am having loads of fun experimenting with making jeans. I don’t have the pattern fitting right yet, partially because I keep playing around with different fabrics (stretch, non-stretch, different amounts of stretch), and partially because I keep messing around with a variety of patterns. So far I think the Jalie 2908 is the best-fitting pattern for my body type. Huh. Patternreview.com readers already figured that out…doh! 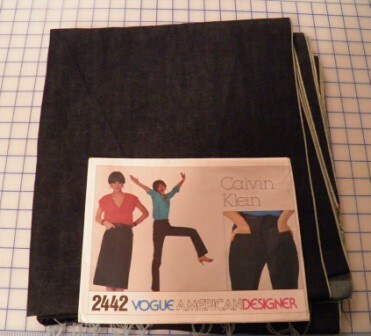 But….I have been kind of obsessed with my vintage Calvin Klein 2442 pattern, so I based my latest black jeans attempt on this design. At least it was my starting point. I tapered the thighs a little and added some flare below the knee instead of keeping the full, straight leg design. And the pattern’s curved waistband was not working for me at all, so I ditched that as well. What I did love about this CK pattern though were the little construction details. Great little coin pocket. Sewn on fly extension. Great curve on the front pockets. I still need to work on the booty fit. I am definitely making progress on the construction details, the fit is improving, but perfection…..not quite there yet. Anyway, I plan to wear these jeans around the house tomorrow and see how they perform. Pictures coming! I bet you thought you could just whack the excess length off the bottom edge of your sleeve pattern, am I right? Bad idea, unless of course you like a really loose fit on your wrist. 🙂 Instead, I’ll show you how easy peasy it is to shorten a sleeve pattern. 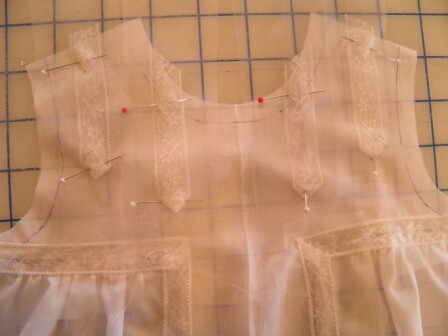 One thing you really need to keep in mind is when doing any pattern adjusting is the grainline. You either need to maintain the existing grainline, or redraw it so it is accurate. For this adjustment it is easy to maintain the existing grainline. Step #1. Fold the pattern piece perpendicular to the grainline mark on the pattern piece. There may or may not be a “lengthen/shorten” line drawn on the pattern, but you can always draw your own. There is already a lengthen/shorten line on my sleeve pattern, so all I did was fold “horizontally” on one of the 2 lines across the entire pattern piece. Notice that the vertical grainline marks are directly on top of each other. This means grainline goodness, peeps. Step #2. 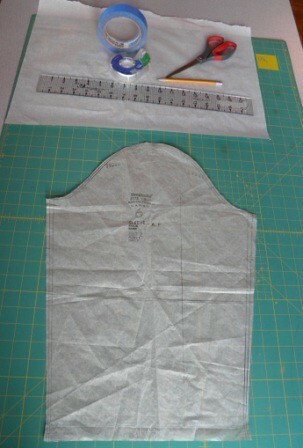 Fold the pattern piece again half of the total amount you want to shorten the sleeve. 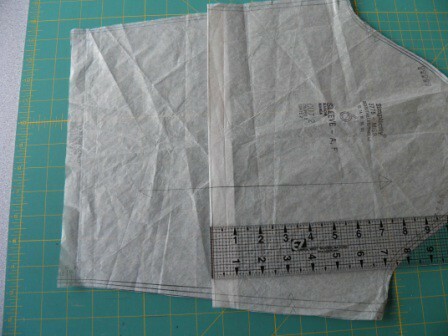 I am shortening the sleeve 2 inches total, so my second fold is 1 inch from the first fold. 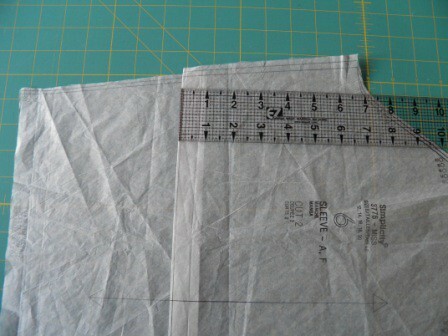 To make sure the grainline is maintained, this second fold must measure exactly one inch across the entire pattern piece, and the vertical grainline must stay parallel. 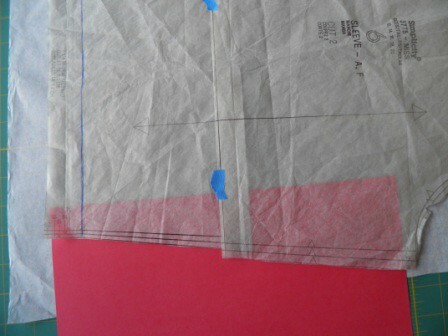 I like lining my pattern pieces up on a grided mat so it is easy to see/correct the grainline. Step #3. Draw the hemline (shown in blue on the left side) across the pattern piece. 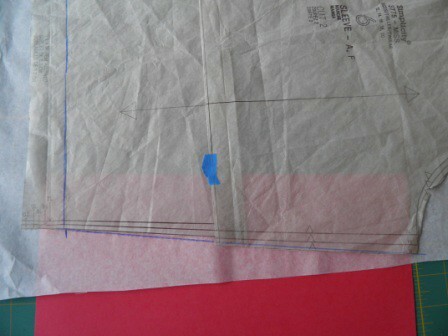 My pattern piece specified a 1 1/4 inch hem, so I drew a blue line 1 1/4 inches from the bottom edge of the pattern. 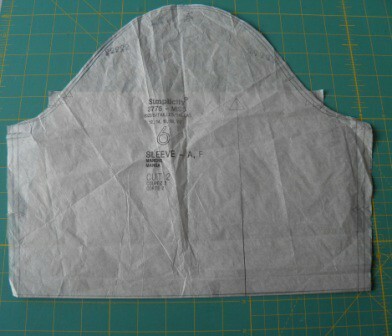 This is all in preparation for blending the little “jog” on the sleeve seam that was created by folding the pattern. You can see the little jog about in the middle of the picture below. Step #4. 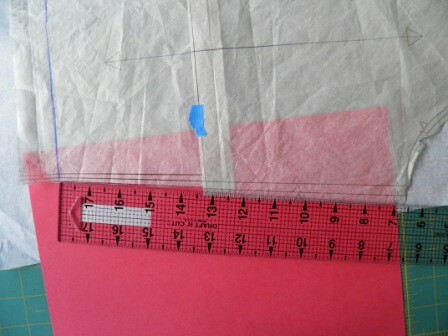 Place the ruler between the “blue hem edge” and the top of the sleeve seam, as shown below, and draw a new line. Easy peasy, right? Tape down the new tissue underneath the original pattern, cut the new sleeve seam on the blended line, repeat drawing, cutting and taping the other side of the sleeve pattern, and then party with your “just right” sleeve. I was at Sew Expo all day Saturday and Sunday, and yes, I am a bit worn out. Lots of walking. Lots of navigating thru large crowds of very slow-moving people. Lots of vendors. Lots of classes. I have a mild love-hate relationship with Sew Expo. 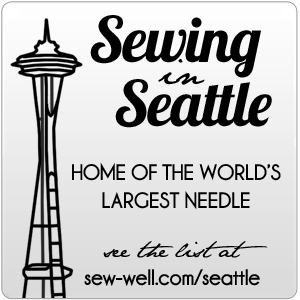 I love the fact that there is this huge gathering of sewing nerds practically in my own backyard—we Seattle-ites are so lucky! Being surrounded by thousands (yes, THOUSANDS!) 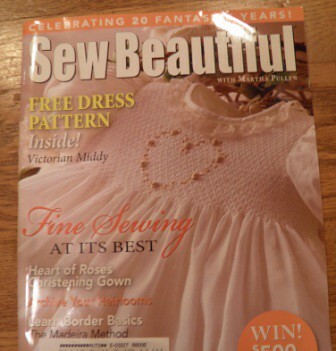 of people who love sewing is totally awesome. The part that bites for me as a garment sewist is that probably 75% of the show is geared to quilters. Definitely a case of the market dictating the offerings. This exhibition is billed as the largest sewing show in the U.S, so for the novice (and even the seasoned) attendee, it can be overwhelming. There are several types of classes offered—45 minute lecture/demos or 1 1/2 hour to 4 hour project-based technique classes. I signed up for the cheapie classes. On Saturday I took a Knit Finesse class from Katherine Tilton, Sassy, Savvy Scarves from Katrina Walker, Details from Sandra Betzina, East Meets West in Surface Design from June Colburn, and It’s All About Needle Felting and Embellishing from Barbara Crawford. I was mostly underwhelmed, tho I did pick up at least a nugget or two from most sessions, and definitely enjoyed June’s design perspective. Barbara was a riot, and her Needlefelting class was fun and interesting. My ASG chapter, Greater Seattle, always hosts an “after Expo” dinner on Saturday night, and as usual it was great fun. I like catching up with folks from my chapter that I don’t see often, as well as meeting new people from around the country. Last year we even had a group of women from Australia! 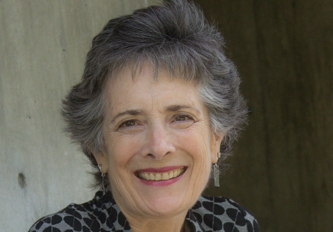 Peggy Sagers of Silhouette Patterns was our speaker this year, and she was AWESOME. It was wonderful to hear how she got started running her own design business. Sunday I attended Contemporary Heirloom Techniques from Kathy McMakin, Turn Your Sewing into Money from Martha Pullen, and Learn to Sew with Your Feet by Debra Justice. All of these speakers were well-prepared and delivered a great presentation—especially Debra. She was entertaining AND packed the 45 minutes with loads of information about specialty feet for sewing machines. I use many of my feet, and I still learned plenty. Nice! I don’t even know how many vendors are at the show. Boat loads. All the big sewing machine dealers are there too. I can’t believe I actually had a demo of the Bernina 830 Limited Edition. I swore for years I was not even remotely interested in an embroidery machine. Evidently I’m now beginning to thaw a little on this issue. Still not enough to lay out $10K for a this awesome machine, but I was pretty wowed. As for monetary damage, I was pretty darn restrained this year. I bought a Silhouette pattern, some accessories from Debra Justice (Labours of Love), some sueded cuddle for a coat for my DGD, a bit more fabric and lace for same DGD’s christening dress, and a “Quick Pleater” tool. I didn’t even require a sherpa to help me haul my booty out to the car this year – amazing! That’s it till next year for Sew Expo, fellow sewing nerds!